The Primary Care Home (PCH) model stimulated partnership working within six months for rapid test sites and redesigned services for at least one patient group across most sites, according to a new evaluation published today. Further analysis of three case studies showed the PCH model acted as a strong catalyst for collaboration between organisations in health and social care, redefining relationships between GP staff and the wider primary care community and creating new multi-disciplinary teams, often co-located. The evaluation from the Nuffield Trust shows the model has promising signs of success and, like most NHS transformation, is on a journey that is likely to take time working with partners, refining initiatives and building capacity to deliver long term outcomes. It suggests the NHS should balance new money for individual GP practices with investment to support these types of multi-disciplinary work at scale. From their analysis, the Nuffield Trust has presented a series of lessons for primary care home sites – eight focus on implementation and seven on evaluation of the model. NAPC Chair Dr Nav Chana said: “This was an early evaluation at the beginning of the rapid test sites journey to develop the primary care home model and was commissioned as a guide to help with their future progress. The National Association of Primary Care (NAPC) commissioned the Nuffield Trust as part of the setup of the PCH programme, to evaluate early development of the primary care home model between July 2016 and March 2017. NHS England Chief Executive Simon Steven launched the primary care home programme in the autumn of 2015, 15 rapid test sites were selected in December 2015. It has since expanded to more than 180 sites across England, serving eight million patients, 14% of the population. Developed by the NAPC, the model is an innovative approach to strengthening and redesigning primary care and is featured in the Next Steps on the NHS Five Year Forward View as part of the practical delivery plans to transform primary care over the next two years. The Nuffield Trust’s evaluation was based on reviews of 13 of the rapid test sites’ plans and priorities for building the PCH model and an in-depth look at the progress and early successes in three case study areas. It was too early in the PCH programme’s journey for the Nuffield Trust to quantify impacts on patient outcomes, patient experience or use of wider health services. Instead the study – known as a formative evaluation – looks at how all sites can make early progress with implementing and evaluating their local PCH models, examining what might stand in the way of change and offers reflections for the NAPC and the wider NHS. The rapid test sites targeted their early work on meeting local health needs and addressing weaknesses in local services. Common objectives among the 13 sites studied included improving care for high-need, high-cost patients, increasing the sustainability of general practice, developing services to keep people healthy and developing new workforce skills. The sites focused on 31 interventions tailored to the needs of different patient groups – with complex or frail older patients the most frequently targeted group. Within six months, the sites had stimulated partnership working and developed or improved services for at least one patient subgroup across most sites. A few were operating as pilot sites for local commissioners who were looking to expand the model. Encouraged to align their local objectives and evaluation metrics with the quadruple aims – by the end of phase one, good progress had been made to select metrics and identify data sources, but none had yet established a systematic process for tracking costs or progress against a defined set of outcome measures. The PCH model was observed as a strong catalyst for collaboration between organisations and care sectors. There were two models of leadership – CCG-led and provider led. Where provider led, leaders felt their independence from the CCG allowed them to make faster decisions. Where CCG-led, they were better able to access whole system data, link work to commissioning priorities and allocate staff and other resources. All case study sites were redefining relationships between GP staff and the wider primary community and voluntary sector workforce, often facilitated by colocation and creation of new multi-disciplinary teams. Patient stories and staff interviews suggested the PCH model had strengthened multi-professional working and stimulated new pathways and services that aimed to deliver high quality care. One of the top priorities for the Healthy East Grinstead Partnership was to increase primary care capacity by freeing up GP time. One project was to offer direct access to hospital outpatient physiotherapy. Early quantitative evidence demonstrated self-referrals increased to musculoskeletal services, freeing up time in general practice. St Austell Healthcare aimed to improve health and wellbeing through their social prescribing programme. This was found to have positive impacts on prevention and population health. As of January 2017, 52 patients had completed 12 weeks of the programme, 94 percent had an increase in wellbeing, 62 percent achieved weight loss. Thanet Health set up an acute response team where a five-day package of care is put in place for frail patients needing immediate intervention often enabling patients to stay at home or be discharged from hospital. A CCG-led evaluation of a four-and-a-half-month pilot recorded a reduction in hospital admissions over the same time. The forecast cost savings were between £0.1m and £0.27m. Policymakers should acknowledge the time needed to build the relationships that underpin a PCH and recognise that within the context of sustainability and transformation partnerships (STPs) which could help or hinder their development, sites will need local commissioners to buy in to the PCH vision. 7. Ensure you have the appropriate analytical resources. i) The three case study sites examined in the study were The Healthy East Grinstead Partnership, St Austell Healthcare, and Thanet Health CIC. ii) A formative evaluation is an evaluation that takes place during the early implementation phases of a project, using early findings to shape the ongoing development of the project. 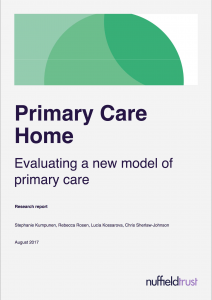 iii) The Nuffield Trust’s formative evaluation of the primary care home model was carried out in two phases between July 2016 and March 2017. The first phase, from July to October 2016 reviewed the 13 rapid test sites through questionnaires, telephone interviews and desk research. The second phase, from November 2016 and March 2017 took the form of in depth interviews with staff at the three case study sites, as well as the development of ongoing monitoring and evaluation approaches. iv) The PCH model aims to achieve the quadruple aims of healthcare: to improve health and wellbeing for patients; improve the quality of care for patients and communities; improve the overall use of local health and care resources and improve staff satisfaction and reduce burnout. vi) The Nuffield Trust is an independent health think tank. It aims to improve the quality of health care in the UK by providing evidence-based research and policy analysis and informing and generating debate.